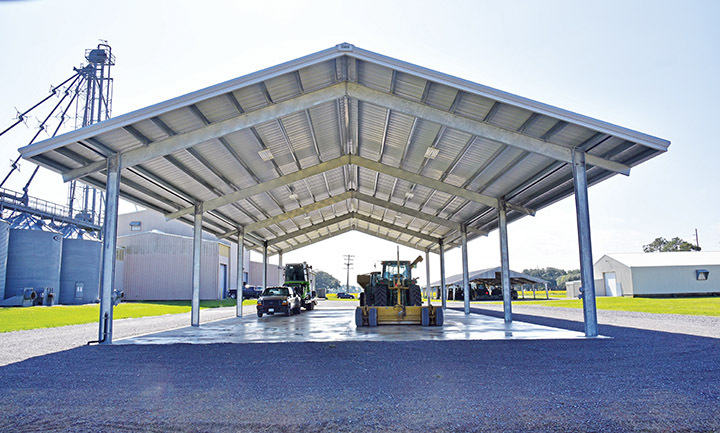 LEFT: A new equipment shed is one of several improvements at the H. Rouse Caffey Rice Research Station that has been funded by the Louisiana Rice Research Board. The structure will accommodate larger farm equipment. RIGHT: A new milling lab will be operational for the 2019 rice crop year. The commercial-scale mill will be able to process and analyze rice grown at the station. Ongoing improvements at the LSU AgCenter H. Rouse Caffey Rice Research Station are aimed at modernizing the facility and maintaining its global prominence in the study of rice propagation. All the improvements are funded with money from the Colombian Free Trade Agreement that was earmarked for research. An addition to the administration building will include four offices and a larger conference room along with storage space. The old conference room in the existing building will be converted into two offices. A backup generator system is being installed to ensure that perishable research tissue and seed will remain viable even if electricity is lost. An equipment storage building near the rice dryer has been built, and a new commercial milling lab will be functional for the 2019 growing season. Also, the station’s labs will be renovated and modernized. Still on the drawing board are a maintenance shop and a greenhouse. Several major equipment purchases have been made, including a seed analyzer to scan rice for shape, size and chalk; an autoclave; two new tractors; and a land-leveling laser system. Last year, a new well and irrigation piping were installed, allowing some fields at the Rice Research Station to be used for growing rice for the first time.